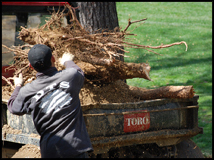 Once a client decides to remove a tree our experienced staff completes the removal process in a safe & orderly fashion. 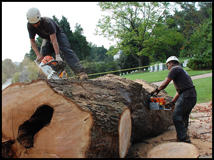 We are not “cowboys!” When removing trees great care is always taken to protect people, property, & structures. Likewise, the job is not completed until a thorough cleanup is done! DTS prides itself on leaving each job pristine and every customer satisfied!